Hypes: 500 miles to the 11.8 Gallon Tank! May 2015 was a happy month at VW. U.S. sales soared by 8 percent to 34,758. Compare that to Fiat/Chrysler’s rise of 4 percent, GM’s 3 percent growth, flat sales for Nissan and Toyota, and Ford’s 1 percent loss, and there’s finally a reason for optimism at VW’s beleaguered North American outpost. 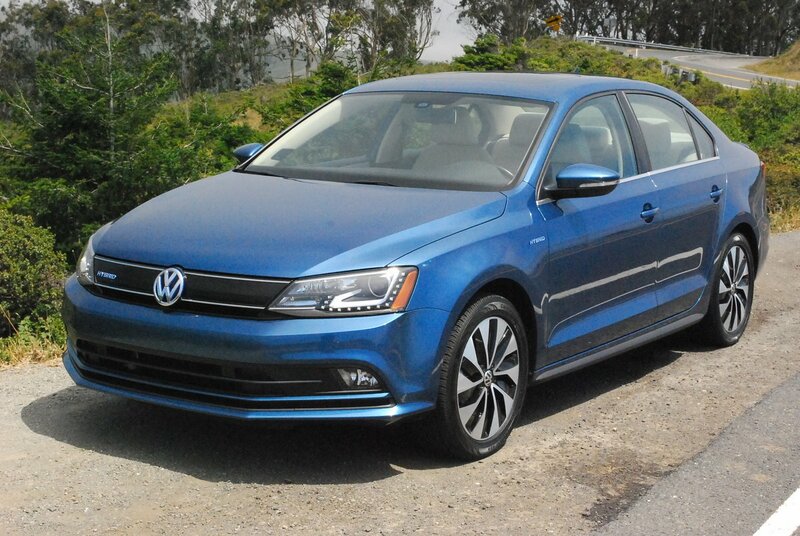 If the 2015 Jetta Hybrid we recently tested is indicative of the company’s newfound attention to detail and quality, then VW has reason to be optimistic about May’s sales portending a sustained trend here. Unlike most hybrids, which require performance sacrifices to compensate for fuel savings, the Jetta Hybrid lets you have it all. Not only is it satisfyingly fast in acceleration, but it is also the exceptional at conserving fuel. 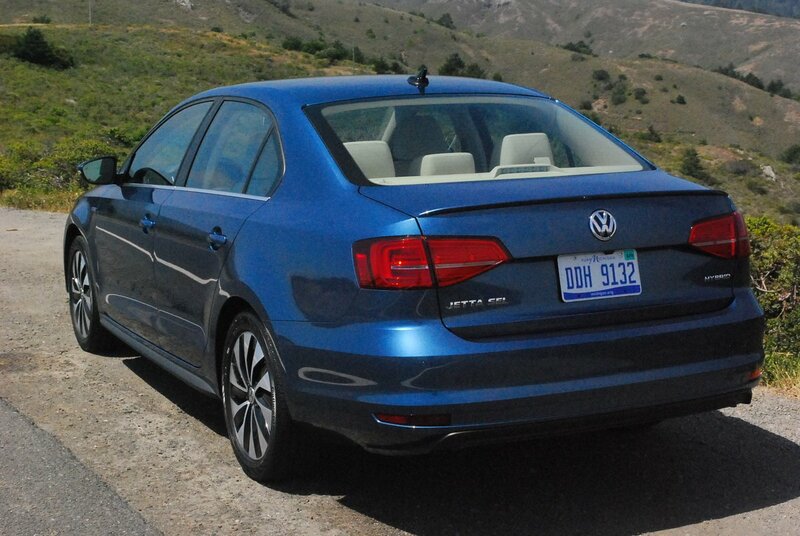 This Jetta posts an astonishing 45 MPG overall rating, with 42 MPG available in city driving and 48 MPG on the highway. Given the Jetta’s fuel tank capacity of 11.8 gallons, your range between gas station pencils out at 531 miles. In view of the Hybrid’s moderate base price of $31,120, this VW offers affordability at purchase reinforced by economy throughout the ownership cycle. It’s no wonder that EPA/DOT’s “Fuel Economy & Greenhouse Gas Rating” confers a perfect score of 10 out of 10 on this Hybrid. But unlike so many other Hybrids with their dodgy steering, tiny rock hard tires, and futuristic interiors, this Jetta is no Jetson. Rather, it behaves like any other VW product engineered in Wolfsburg, Germany. The seats, dashboard layout, instrumentation, and shift mechanism will all look familiar to longtime VW owners. The super supportive front seats are exceptionally comfortable and nicely finished. The back bench seat works well for medium sized adults, with a useful drop down armrest available between the two outboard positions. Those taller than 5’8″ might find foot room restricted when the front seats are positioned at their mid-track position. Although the Hybrid unit necessitates a rather large hump intruding into trunk storage, you can partially overcome the problem by folding both rear seats flat to gain more space. That armrest between the back seats contain a handy knockout panel which allows you to carry elongated cargo like skis while still leaving the seat backs in their upright position. All in all, a typically useful VW smorgasbord of carriage options. Whereas most Hybrids inflict jerky power transitions in the switchover from electric to gas operation, this Jetta makes the switch quietly and unobtrusively. The only time you really notice the amalgamation of power sources is when you tromp the accelerator. 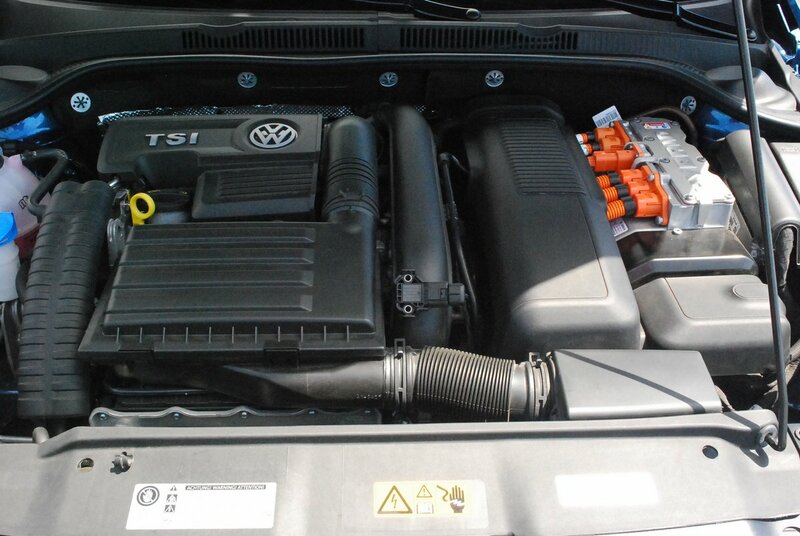 That’s when the sudden infusion of turbo boost and electric motor thrust enables the Jetta to spring forward decisively. In fact, the seat of your pants will quickly inform you that this Jetta’s 177hp is more than enough to cope with any power need you may encounter. The first time I pulled out to pass a slower car on a 2 lane highway, I was gratified to complete the maneuver with a huge safety margin I frankly did not expect. You can drive this Jetta over challenging terrain, safe in the knowledge that it will handle crisply. 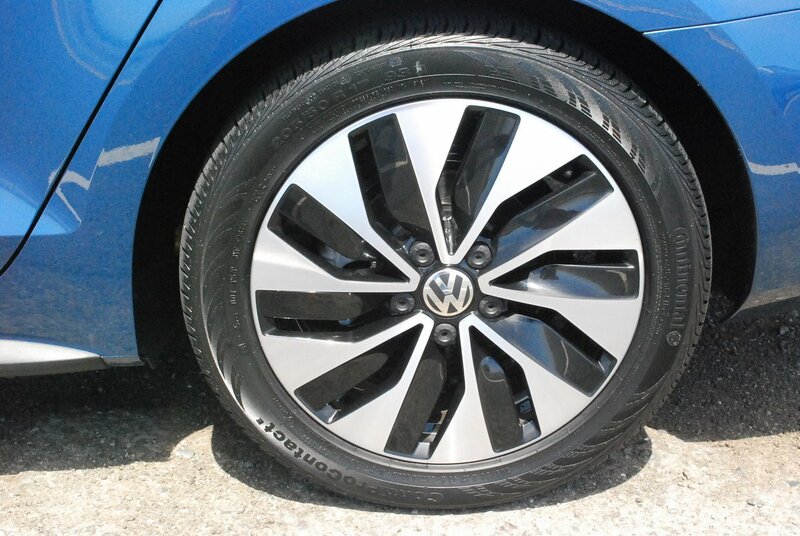 The surfeit of adhesion is due in part to the Hybrid’s stable platform, precise electro-mechanical speed sensitive power steering, 17 inch standard alloy rims, and sportingly serviceable Continental Conti Pro Contact rubber (205/50R17). From a performance standpoint, the one area where the Hybrid is deficient is braking feel. Like so many others of its ilk which depend on regenerative braking to recycle brake heat into energy, this one too suffers from a somewhat spongy and unpredictable pedal. When the same amount of braking force does not always produce the same stopping result, it leads to the inescapable conclusion that pedal feel is a crap shoot that varies from stop to stop. But in the big picture, it’s a relatively minor irritation that can be avoided by always braking earlier than you normally would. Aside from that caveat, the 2015 Jetta is a thumbs-up proposition all around. VW has done a minor facelift of the grill, and added Bi-Xenon adaptive headlights to the SEL Premium package, along with a new dash center stack, and upgraded interior materials. All in all, the Hybrid Jetta garners best-n-class honors by offering scintillating performance combined with stupendous fuel economy.